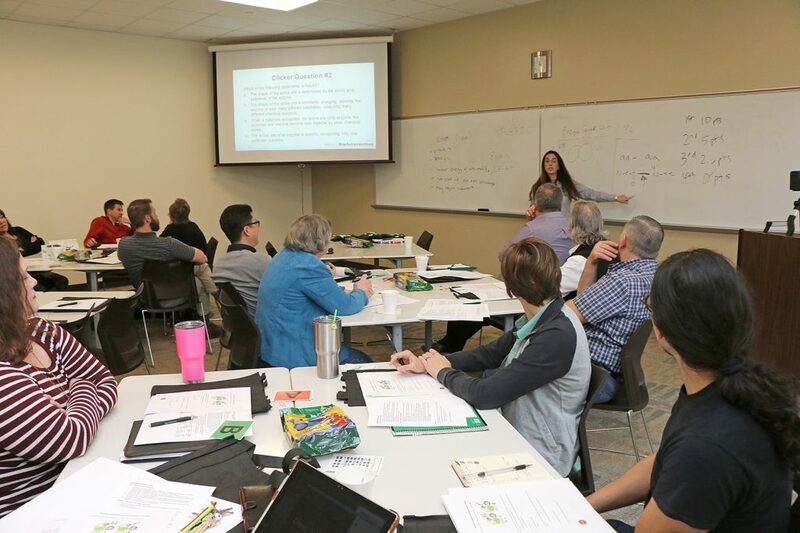 Paris Junior College recently hosted a workshop with Howard Hughes Medical Institute (HHMI) BioInteractive to assist instructors in using their free teaching resources to promote student-centered, active learning. The workshop targeted college and university instructors teaching introductory courses in biology, cell/molecular biology, and genetics. Attending the workshop were thirty instructors from Texas A&M University-Commerce, Panola College, Tyler Junior College, the University of Texas at Tyler, Collin College, Northeast Texas Community College, Texarkana College, Grayson College, Dallas County Community College District, and PJC. Dr. Brown organized the workshop with Dr. Javier Robalino, HHMI’s Higher Education and Spanish Language Outreach and Professional Development specialist. He came to HHMI after a career researching invertebrate antiviral immunity and teaching undergraduate biology and genetics. He earned his MS in marine, estuarine, and environmental sciences from the University of Maryland, and his Ph.D. in cell and molecular biology from the Medical University of South Carolina. Joining Dr. Robalino in presenting at the workshop was Dr. Rebecca Orr, who is certified in team-based learning skills and teaches biology at Collin College. HHMI BioInteractive supports quality science education by providing educators with free resources focused on current research, to clarify important scientific concepts and instill in students a passion for and an understanding of the scientific process. As part of their outreach effort, they present their resources at dozens of workshops annually at educational institutions, professional development conferences, and professional society meetings.